We’re always up for some lavish meals especially when it comes to celebrations. This year, we are going deep into the roots of the Island’s richness of arts and cultural heritage by celebrating the impressive diversity of its gastronomic arts and present it in a most stunningly delicious 6-plate Island of The Gods inspired feast. Come just in time to join our bar crew and watch the sun go down for the very last time enjoyed with their most delightful concoctions and the super adorable performances by the Balinese kid flower dancers at their vibrant rooftops. Soak up the New Year celebration scene of festive local meals, endless yummy tipples, and curious party packs that lead up to the final countdown moments filled with countless hugs, kisses and bubbly toasts of stepping into a brand new year. 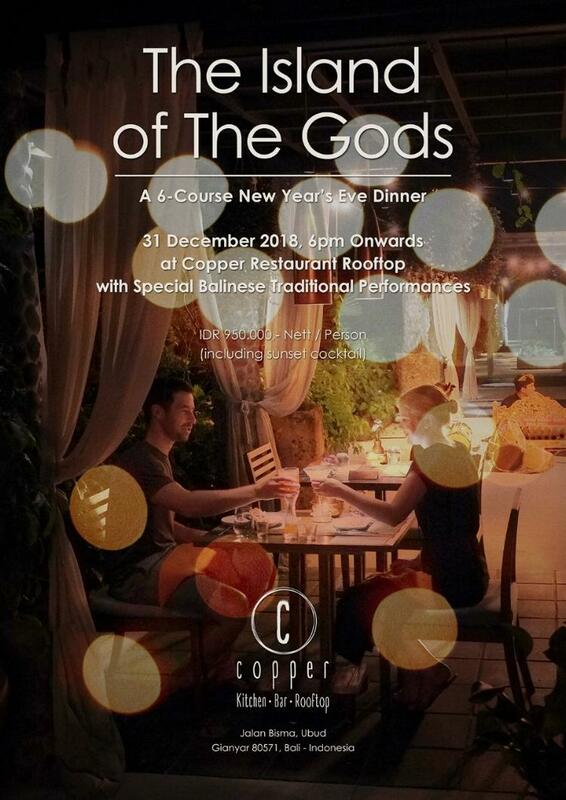 Join our New Year’s Eve Rooftop Dinner in rooting back to the Bali we all love, one and only world’s Island of The Gods, and celebrate its diverse gastro arts to begin 2019 on a high! IDR 950,000 nett/person (including one hour of sunset cocktails).